Gutmann spent seven years researching the book, and said he wanted to bring a human face to the problem. “The Slaughter” focuses on specific people, telling the stories of several Falun Gong practitioners and the horrors they faced. When Falun Gong, a meditation and qigong practice that was very popular in China began to be persecuted in 1999, the prisons and labor camps were flooded with millions of adherents, and China’s organ harvesting rates climbed exponentially, said Dr. Noto. China has never explained the source of its organs beyond contradicting previous denials that it used executed prisoners. 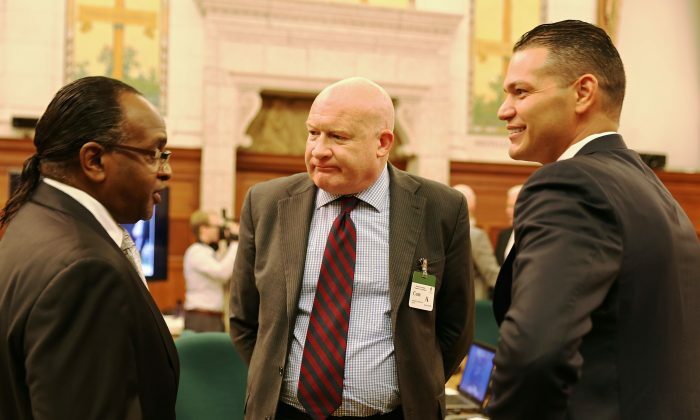 “The testimony today was sort of a tipping point in terms of our awareness in regard to organ harvesting in China,” said Tyrone Benskin, a New Democratic Party member (MP) of Parliament, echoing an earlier comment by Liberal MP Irwin Cotler during the testimony. Now the question is what to do about it, he said. While it is difficult to take measures that would affect what happens in China, Canada could immediately move to stop transplant tourism and keep Canadians from traveling to China for organs, he said. Cotler introduced a bill last December in that vein that would level sanctions against anyone known to be involved in the organ transplant trade, but the chances of it passing are, for political reasons, unlikely. “If we do not act then we become complicit in that criminality, and so there is a responsibility on us here as parliamentarians, as a government, as civil society to hold China to account,” said Cotler. He said there needed to be a multipronged approach to stop organ harvesting in China, including legislation and drawing attention to the practice. “We have to both expose the cover-up and at the same time make it clear that what is being done here is, as I said, are crimes against humanity,” said Cotler.